I'm a winner! I took part in a shop hop a couple weeks ago, and found out today that I was the grand prize winner for one of the shops. Almost didn't check that e-mail...all those "You're a winner!" e-mails look like scams. Today's block looks easy and nice, but I don't really like the block itself very much. The Halloween fabric is fun, though. Congrats on your win! You deserve it! 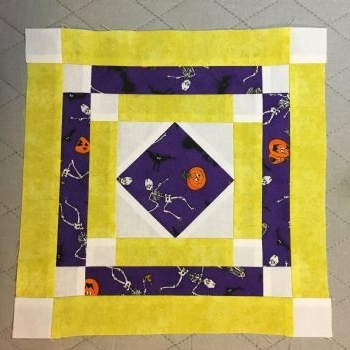 Regarding this block--I love the diagonal pattern of the white squares on the corners and the Halloween fabric is nice. Perhaps if you had used orange instead of the yellow you might like it better?